joe wrote: I ended going with 2- 100 watt solarworld panels from E -marine I could have fit a smaller size 20 watt in the middle but it would have pushed the ends of the 100s outside of the existing frame and it required shimming for it to fit and I didn’t feel it was worth the hassle . Thanks to all.Hope panel size comes down over time would love to fit 300 watts in existing footprint . It's just a matter of time. Panels have been getting smaller and more efficient. In fact, several months ago when the administration anounced the tariff on solar, I went ahead and purchased 4 panels, figuring I'd beat the price increase. Instead, retail prices have not increased, and several smaller, more efficient model have come out that would have saved space. Oh well. But they are from an unknown seller, so I went with a the Eco-worthy 100 watt jobs I mentioned above, which will fit easily within the existing frame. Here's a pic of the 2001 PDQ 36 Bimini with solar. I realize this is the 32 forum and maybe I should put it on the 36 forum, but we seem to be talking about the same solar panels here, so I guess I'll post it here. As you can see, there are 3 original Siemens panels that we've been discussing, plus a semi-flexible panel forward of that, which I installed. As you can hopefully see, each of the Siemens panels lays into its own space, surrounded by 4 small fiberglass towers a couple inches high with washers on top to hold them in place. So installing a different size panel would be a bit of a headache and would require some fiberglass work. Along this subject, maybe those who have already upgraded solar panels on the hard bimini of the 32 can provide some enlightment as to wiring. 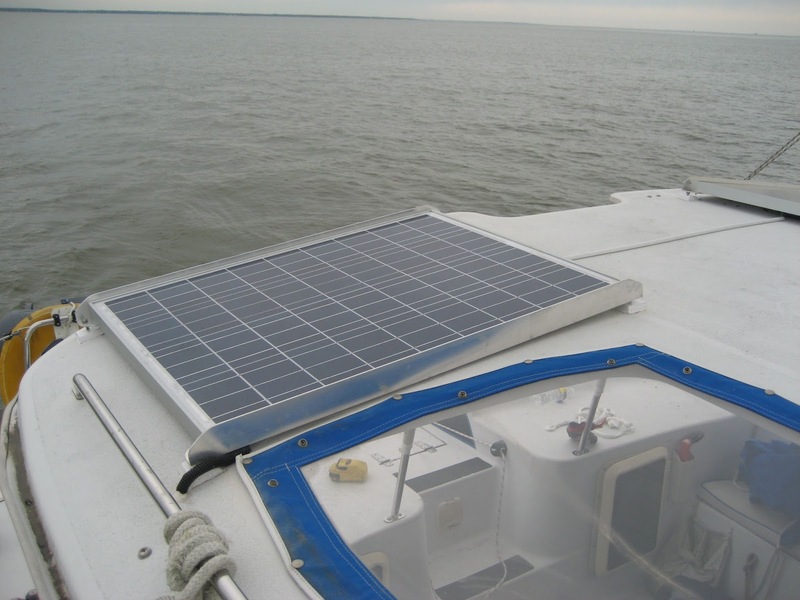 How do the solar panel wires go from the bimini top to the boat interior? I'm assuming that there is a conduit thru the hard top and down one of the stainless supporting struts. I am upgrading from 150 watts to 500 watts and will be running a significantly larger wire, probably 8 gauge. Do you think there be a problem running the heavier wire through the existing conduit? Also, I'd be interested in what was done with the solar controllers. The existing controller is a small pwm type located in the area with the steering and cockpit instruments, the MTTP controllers I am getting won't fit and I'm not sure where I'm going to put it. No room in the stbd cabin access area where most the major battery wiring is located. Thanks for any input. I fed mine through the top into the helm light fixture. From there the wires go down the support and into the cabin. I recall fishing wires was a reasonable one-man job and that large wires should fit (I think mine were #10 and there was lots of space). I installed my controller in the locker inside the cabin but under the helm seat. Lots of space, easy to fish the wire, and easy to tie into the bus. Much better. thinwater wrote: I fed mine through the top into the helm light fixture. From there the wires go down the support and into the cabin. I recall fishing wires was a reasonable one-man job and that large wires should fit (I think mine were #10 and there was lots of space). Thanks Drew. Good info. I'm not sure my Admiral will agree to part with giving up some of her locker space (we're going to be living on board) but that's a good idea.